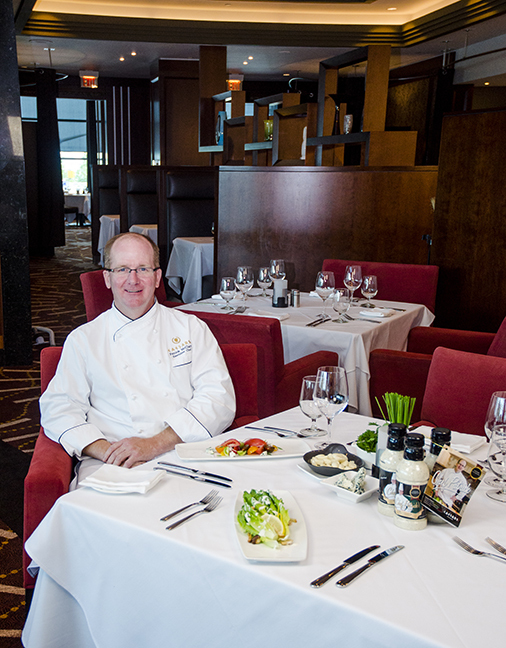 Caesars Windsor’s Executive Chef Patrick McClary is back again with another saucy creation from the exclusive Caesars Signature Collection – a creamy Buttermilk salad dressing. Previously, McClary launched a successful smokey hickory barbeque sauce back in January that was an absolute hit and has sold out at Caesars Essentials, the casino’s gift shop. This creamy dressing is packed with delicious flavour starting with a zesty hint of lemon, followed by subtle tastes of garlic, onions and herbs. This versatile dressing can be served as is or transformed into three unique and classic dressings. Included with each bottle is a personal recipe book from McClary featuring a Caesar, blue cheese and buttermilk ranch dressing. We decided to create Chef Patrick’s classic Caesar salad. Check out the recipe below! After refrigerating the dressing for about an hour, we mixed it generously in romaine lettuce and topped it off with croutons and Parmesan cheese. The anchovy and Dijon mustard gives Chef Patrick’s dressing a rich, tangy and salty flavour that complements the added garlic and Parmesan cheese. Feel free to squeeze more fresh lemon juice to give your salad a great lemony kick. The Buttermilk dressing serves as a great base for the Caesar. The dressing also makes a great dip with fresh vegetables. “This salad dressing is a family favourite in my home, I am very excited to see others share it with family and friends too,” he added. Chef Patrick’s Buttermilk salad dressing is sold at Caesars Essential, the gift shop located just off the sky bridge at Caesars Windsor for $7 plus tax (Please note guests must be 19 years or older to enter casino). Due to popular demand, stocks will be replenished of his barbecue sauce, coming soon.